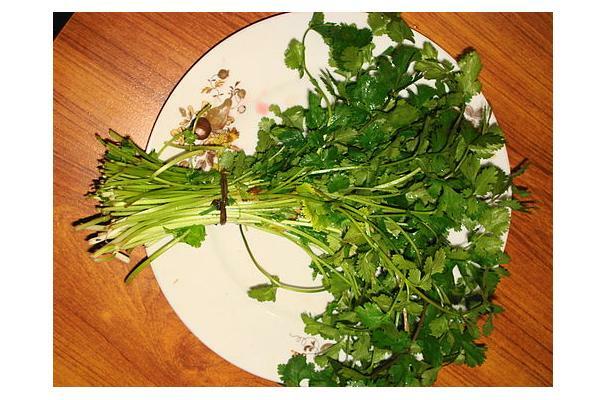 Cilantro is commonly associated with Mexican cuisine and is also popular in South Asian cultures. It has an aromatic flavor that is good both raw and cooked into dishes. Many people do not like the taste and describe it as tasting similar to soap. It is believed that the reason some people dislike cilantro is tied to the acidity level in their saliva, which causes it to taste different to them. Cilantro is a bright green herb, with leaves that resemble a lacy 3 leaf clover. The leaves are soft much much like basil in texture.It has a pungent aroma and pairs well with lime and tomatoes. Choosing: Look for bright green leaves with no brown. The leaves should be perky and not wilted. Buying: Available at most grocers year round. Available at farmer's markets in the summer months. Cleaning: Rinse the leaves and shake off the excess water.